Finally it’s time for the Third Examination. From here on it’s individual battles, and the examinees get to display the fruits of their training in a tournament style battle. 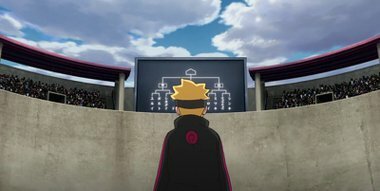 The tournament rounds are displayed, and Boruto’s first opponent is Yurui of the Hidden Cloud, Shikadai’s is up against Yodo of the Hidden Sand, who is always listening to music on her earphones, however….